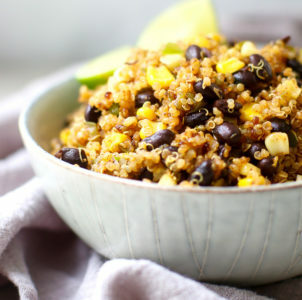 This black bean fried quinoa is a quick and easy vegan meal. Use up leftover quinoa and black beans for an easy meal prep recipe! Heat the oil over medium-high heat. Sauté the onion and bell pepper in the oil until translucent. Add the chile powder and garlic and sauté for 1 minute. Add the quinoa. Cook until any lingering oil or moisture is absorbed. Add the black beans and corn. Heat through and serve. For extra flavor, add a squeeze of lime and chopped cilantro on top. If using canned beans, add one can of rinsed and drained black beans.